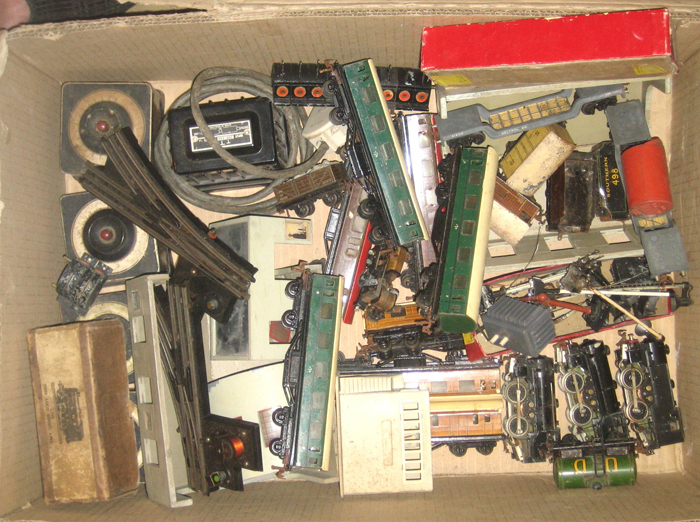 Over the years, several people have contacted me with offers of Trix trains. Although I have over 100 locos in my collection, it is always nice to find missing items or examples in better condition. I have included some of these on the page below. Sometimes I buy damaged and scruffy items to repair and restore. The boxful shown below is a good example! If I don't buy your items I am happy to advise on their value or where to sell. Please email, or ring 020 8977 1802. Complete collections bought. 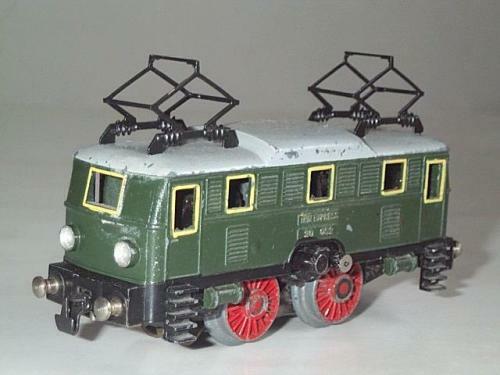 I'm still looking for a 'Nord' loco which was made by Trix for sale in France. 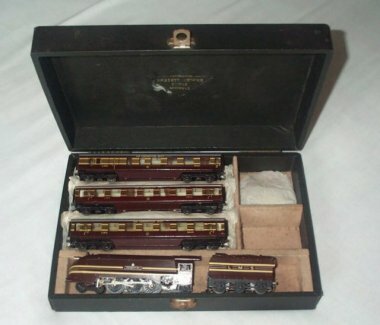 Here is a smart pre-war Coronation set, in its wooden presentation cabinet. This loco is a model of a Midland region 'Compound'. Normally, Trix Compounds are either LMS or BR black, or LMS maroon. This one is in BR green livery, which is quite rare. Although the tender transfer is not perfect, the overall condition of the paintwork and lining is very good for a 1955 model. I was very pleased to be able to add this to my collection, thanks to an internet contact. Here is another German loco that came via the US. It is probably one of the oddest looking things that Trix made, a four-wheel model of an electric engine. These were sold in Britain and Germany - the British versions generally have black wheels. The fake pantographs on the roof were completely wrecked when I got the loco, but these replicas look as good as the originals. Here's a Meteor Whistling Diesel Express from 1955 that I received. Although the paintwork is in good order, the internal mechanism required a lot of work. If you look at my Meteor servicing page you will get an idea of the complex internal construction. I have restored the reverser relay, soldered several broken wires, rewound the whistle relay coil, and tried (and failed) to coax a squeak from the whistle. However, the main thing is that the loco now runs well. Please see my Meteor servicing page for more information. So it's thankyou to everyone that has contacted me with offers of dusty Trix from their attics. Please email me if you even have broken old bits and pieces, these can often be used as spares or rebuilt.